I’ll go ahead and let you know that there isn’t any nutella in these energy bites. Sure, I love nutella as much as the next person but it’s not exactly a food that I want to be snacking on day after day. I remember when I first realized that nutella was not the same nutritionally as other nut butters and I completely lost it. What? This chocolatey spread that I’d been smearing on just about everything was only made with a small amount of hazelnuts and a lot more sugar and chocolate? Major bummer. Of course, I still eat it on occasion as I believe that all foods can fit. But, I stopped pulling it out as an appropriate topping for waffles, bread, apples, crackers, pretzels, um… you get the drift. These do taste like nutella! Thanks to a generous amount of roasted hazelnuts, cocoa powder and perfectly sweet dates. 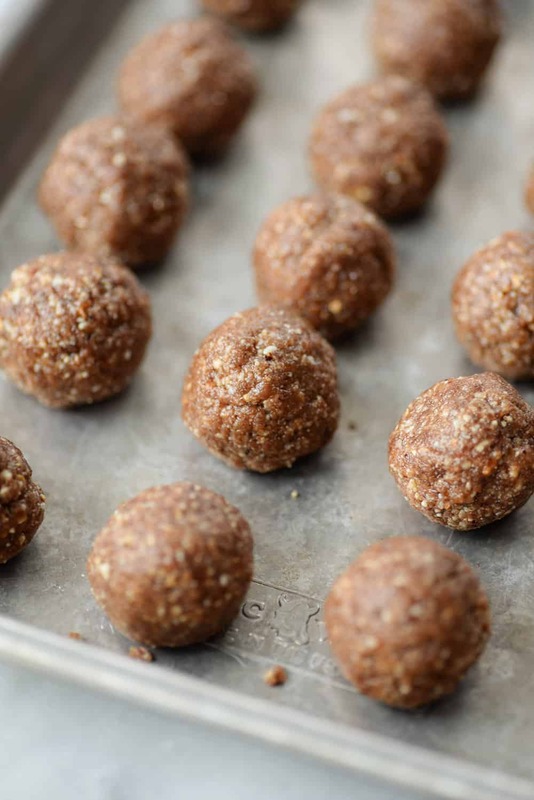 They are packed with fiber, plant-based protein and naturally sweetened. A delicious snack for you, for me and for our kiddos. Dates are pretty magical. I like to think of them as natures caramel. 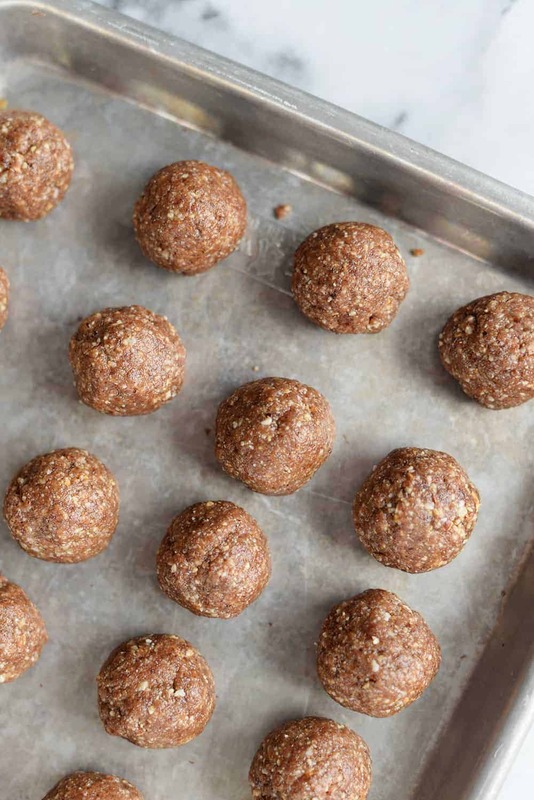 If you haven’t had the pleasure of using them in energy bites before they not only provide just the right amount of sweetness but help bind the other ingredients together. If your dates are very hard, then you’ll want to soak them in a bit of hot water before processing. Otherwise, your food processor is going to get quite the workout. You could use all hazelnuts here but to save money, I threw in cashews and slivered almonds to the mix. Regular almonds will work, but the slivered blanched kind are skinless and therefore won’t change the color. Whirl those together in a food processor until very finely chopped. Take care not to turn them into nut butter as you want actual pieces of the nuts in the final balls. Add the processed nuts to the softened date mixture and combine into a dough. To make these balls extra creamy and smooth, I threw in a little peanut butter to hold everything together. However- here’s where you can go crazy. If you can’t imagine the thought of nutella balls without nutella, then go ahead and swap some in for the peanut butter. It doesn’t even have to be real nutella, there are countless recipes for homemade versions and Justin’s makes a delicious chocolate nut butter. You don’t need much, just enough so that these are easy to roll together. Roll and place in the fridge and you are done! We’ve been loving these as an afternoon pick-me-up snack or sweet treat before bed. However you enjoy them, I hope you love them as much as we do. Need a healthy snack? Try these. Vegan and Gluten-Free Nutella Energy Bites! 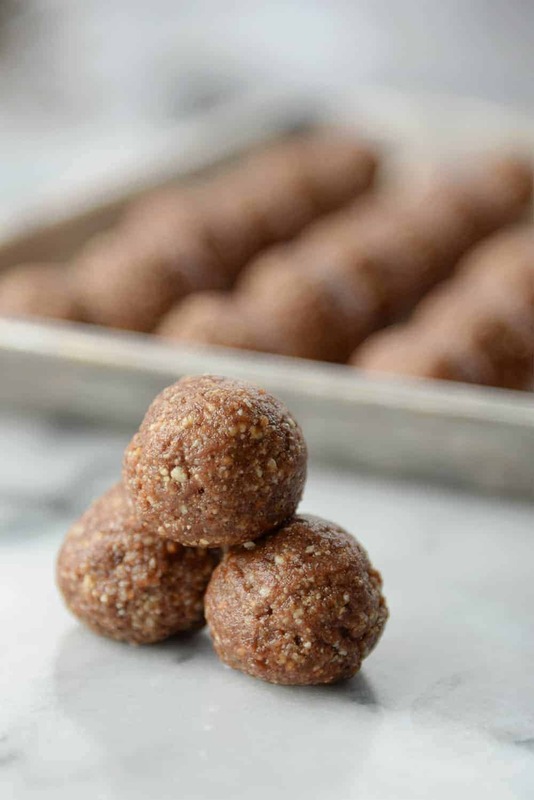 Made with nuts and dates, they are the perfect snack and great for kids! Preheat oven to 300 degrees F. Place hazelnuts, almonds and cashews on a baking sheet. Roast the nuts for 10-15 minutes until just golden brown. Rub the hazelnuts to gently remove as much skin as possible. In a food processor, process the nuts until finely chopped. Remove the nuts and set aside. In the empty food processor base, place the dates, coconut oil, vanilla and cocoa and process into a paste. 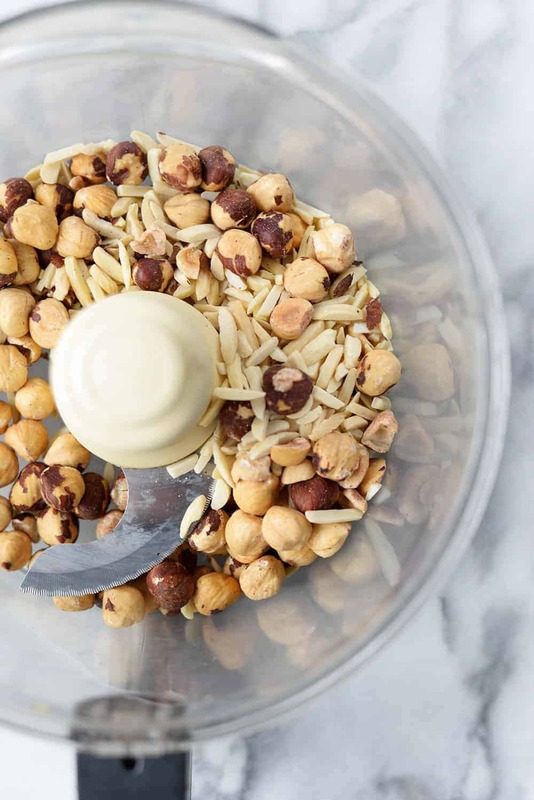 Add the nuts and 1/4 cup of the peanut butter to the food processor back to the food processor and process until a sticky dough forms. Add more of the peanut butter, if necessary to have it stick together. Roll into tablespoon size balls (I used this scooper to remove the balls) and place on a baking sheet. Place in the fridge until hardened, then enjoy! Store in the fridge for 1-2 weeks. I love this method of making a high energy snack! Having them in a rolled up ball form makes it soooo much easier to just grab and go or to pack for whatever occasion. I think that this is fantastic! Thanks for sharing! Thanks for the little pointers on optimizing the use of the food processor so that it doesn’t get overworked. SO yummy! I don’t know if they actually give me energy, life with a 2 year old and 2 month old has me constantly in a fog, but they’re so delicious and satisfy my sweet tooth!